Following the Yellow Brick Road does have its perils. There are things like lions and tigers and bears, Oh, my! And what about the poppies and other obstacles that might pop up in the way. 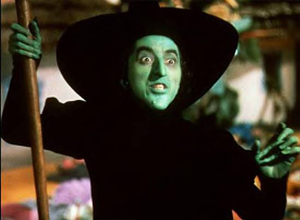 Of course, the most fearsome obstacle might be the wicked tech witch that pronounced my dead device “out of warranty by condition.” What would happen then? There may be more than one way to defeat a tech witch. After all, if moisture can kill my device, perhaps a good bucket of water can defeat the tech witch. You’ll just have to tune in for more news as it happens. In the best of all possible worlds, to borrow from Voltaire, there will be a shining emerald city at the end of the road, with a very benevolent tech wizard who will magically resurrect my dead phone and place it in perfect working order. 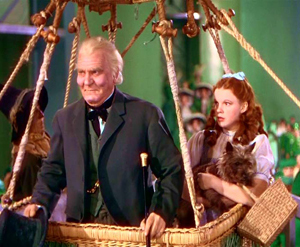 Then, with all of his magical powers he’ll whisk me back to Kansas, along with my irritating little dog. Of course these days we don’t navigate with primitive instruments the way they did when Dorothy was rampaging through OZ. We have cell phones, with GPS, to help us find our way back. How ironic. Which will it be, Witch or Wizard. We shall have to see.